I work with Photoshop, Sketchbook Pro and a Wacom tablet. I require a 50% deposit with initial roughs, and the remaining 50% due upon final proofs. I allow for one revision with my quoted rate. I use the GAG most recent pricing for almost all of my rates, although some special circumstances warrant price consideration. I use Paypal for all invoicing and transactions. I email .pdf’s or .png’s for final artwork. If another form of file is needed, I use DropBox. Please note: Serious inquiries only please. I am willing to work with Self Published Authors only if they are willing to meet the fair price rates for book illustration. I do not work for free and do not expect anyone else to. 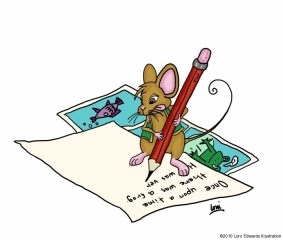 If you are an author and are looking to get published by a large publishing company, you do not need the illustrator. Editors of large publishing houses pick the illustrators, usually not the author. Thank you for your interest!